It’s that time of year when the strawberries and cream appear and everyone fancies a spot of afternoon tea on the lawn (or paving slabs in my case). So, rather than using all your Syns on a delightfully spiffing, but high in fat mound of cake, take a look at our Top Slimming World Afternoon Tea Recipes…and have your best china at the ready! Cakes and sandwiches can be really high in Syns, so we’ve chosen some great Low Syn versions, and alternatives so you can stay on plan without compromising on all the goodies! Some of these recipes use your Healthy Extra A or B, so be sure to keep track of what you’ve had to protect your weight loss! 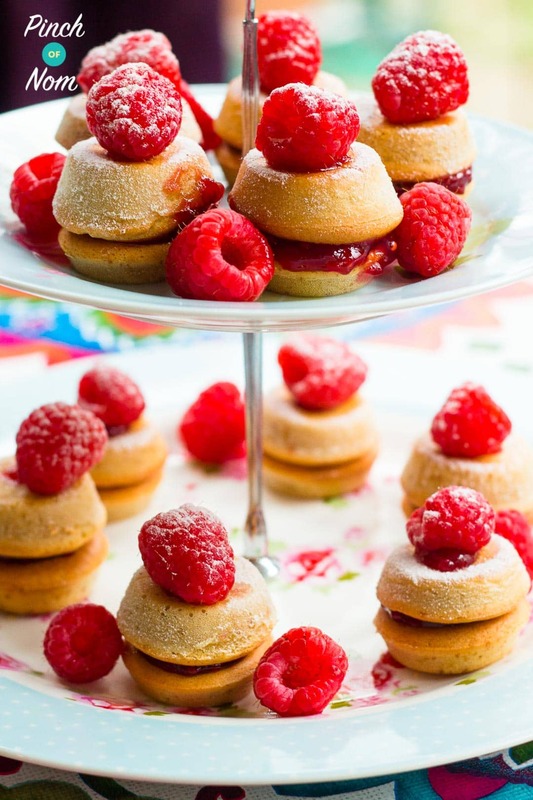 Here’s our Top Slimming World Afternoon Tea Recipes! 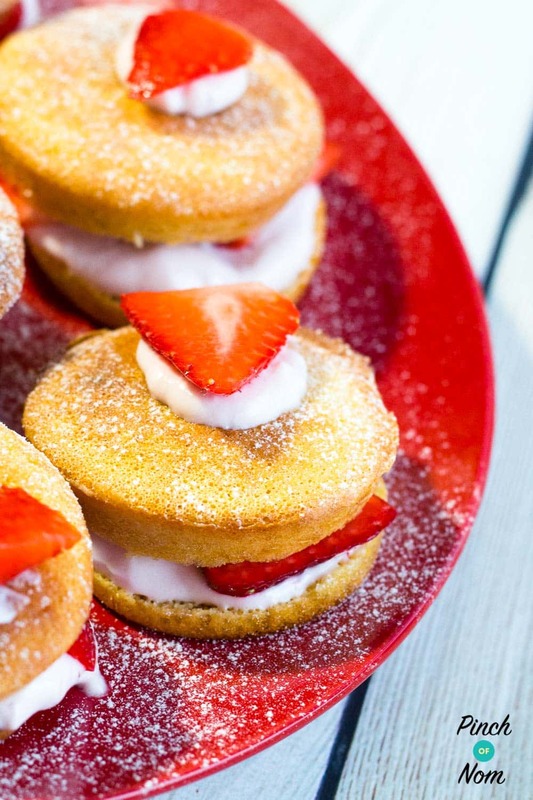 Our Top Slimming World Afternoon Tea Recipes wouldn’t be complete without these Low Syn Mini Victoria Sponge Cakes. Proper cakes, but in miniature, these cakes are the perfect way to start an afternoon tea. 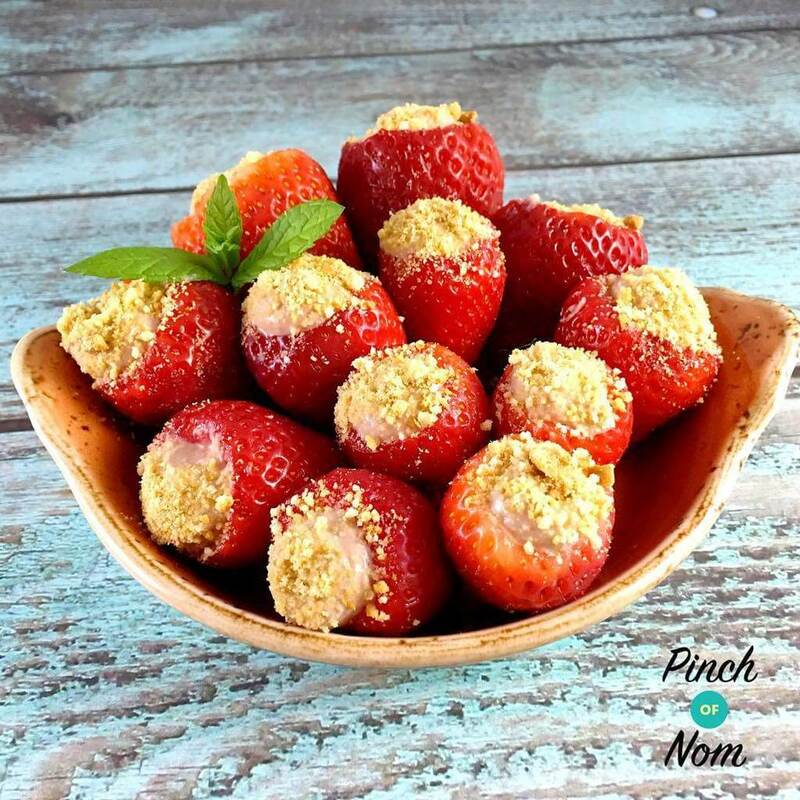 And if you prefer strawberries, how about these Low Syn Mini Strawberry Sponges? You could really use any soft fruit you fancied – blueberries, blackcurrants, redcurrants…why not choose something from our Slimming World Speed Food List? 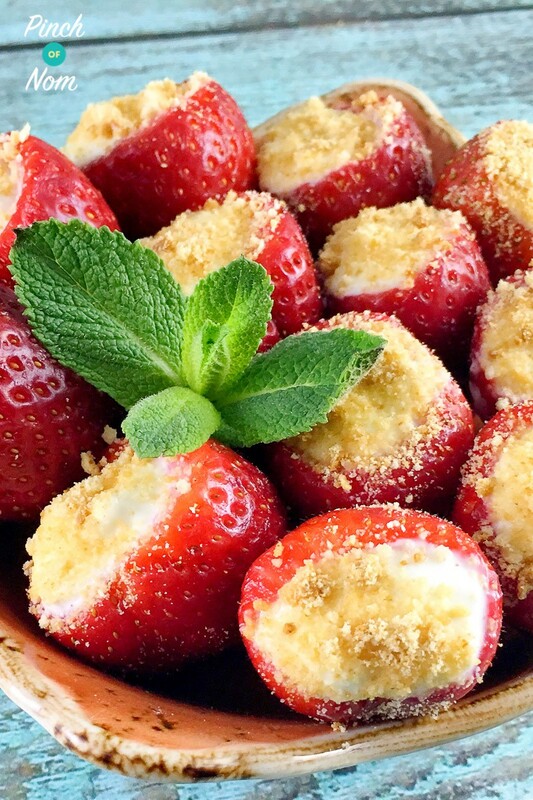 Strawberries and cream are a summer time staple, but these Low Syn Cheesecake Stuffed Strawberries are even better! And what’s more, they’re SUPER low in Syns, meaning you can enjoy a whole heap of them on your afternoon tea! We’ve even got a completely moreish Low Syn Chocolate Cheesecake Stuffed Strawberries version for all those chocolate fiends out there! Next up on our list of Top Slimming World Afternoon Tea recipes are our Low Syn Mini Lemon Curd Cakes. Even if you’re a bit of a novice when it comes to baking, you’ll be sure to find these super easy to bake and add to your afternoon tea selection! 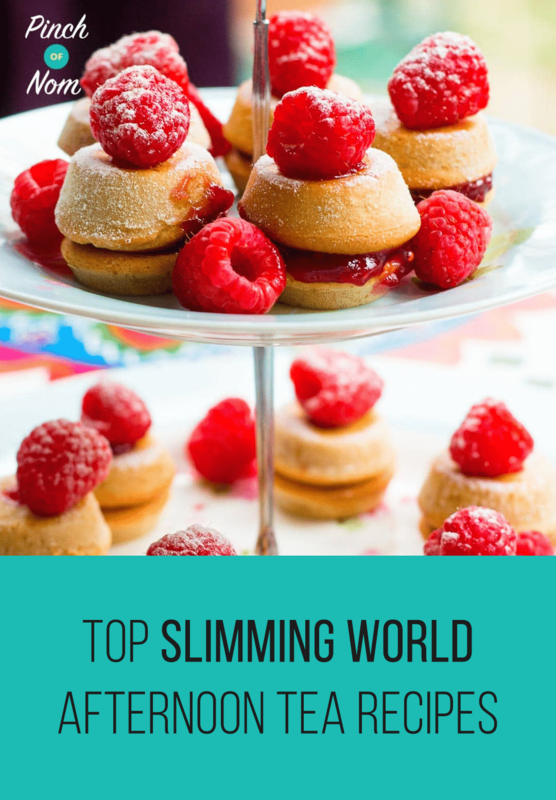 The reason that they Syns are so low on this Slimming World afternoon tea recipe is because it uses a whisked, fatless sponge. This means that when it’s divided out into individual cakes, it calculates to just 1 Syn per three cakes, a proper Syn bargain! 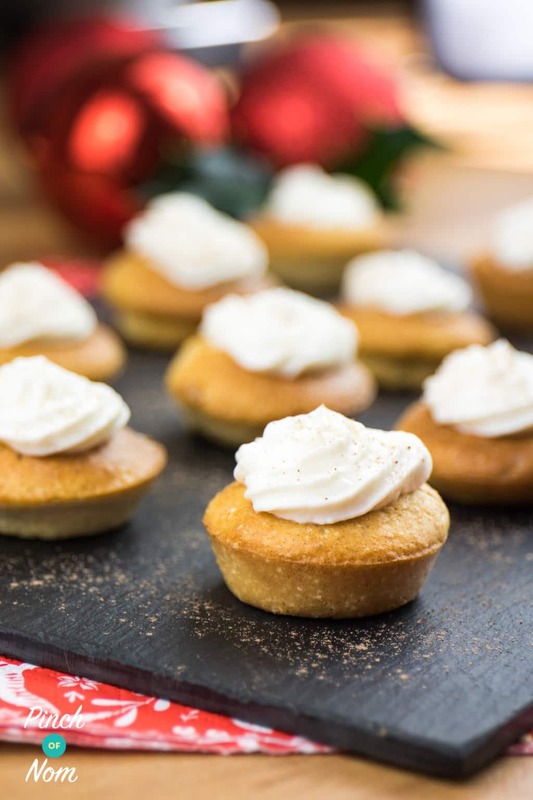 The great thing about our Low Syn Mini Lemon Curd Cakes is that they taste just like a ‘normal’ cake, but without the high Syn value, making them a fantastic Slimming World afternoon tea recipe, even if you’re cooking for those not following Slimming World. We’ve got for you next another savoury treat for your afternoon tea, Half Syn Whipped Blue Cheese Crostini. This is one of our Top Slimming World Afternoon Tea Recipes for a very good reason; they’re rather posh looking without the faff! 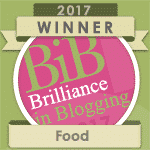 They’re also fantastic on Syns – just 0.5 Syns per canapé. These make a great addition to your Slimming World afternoon tea if you’re after a savoury hit for a big occasion! Who can resist a chocolate brownie?! 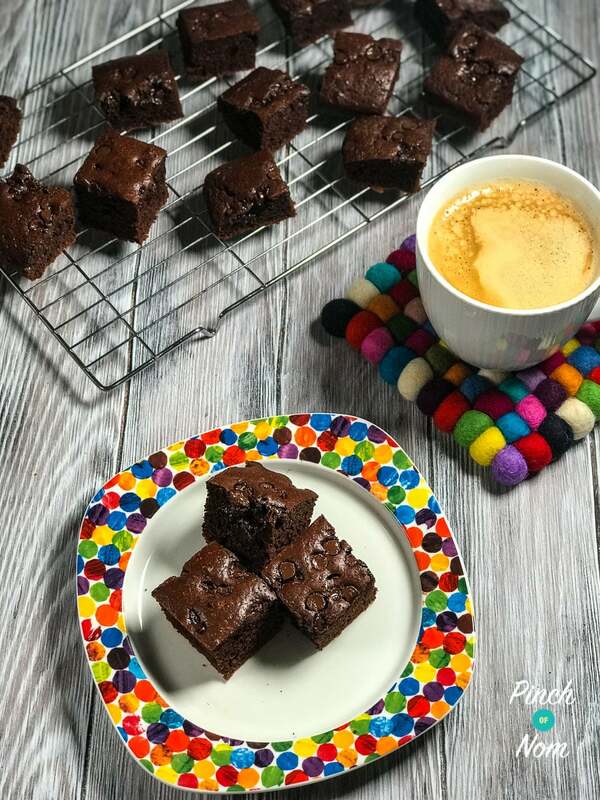 These Low Syn Chocolate Brownies will save you bags of Syns but keep that chocolatey hit required on an afternoon tea platter! These work perfectly with either a cup of tea (from a pot darrrhling! ), or a coffee. You could even sneak in a Syn Free Pumpkin Spiced Latte! 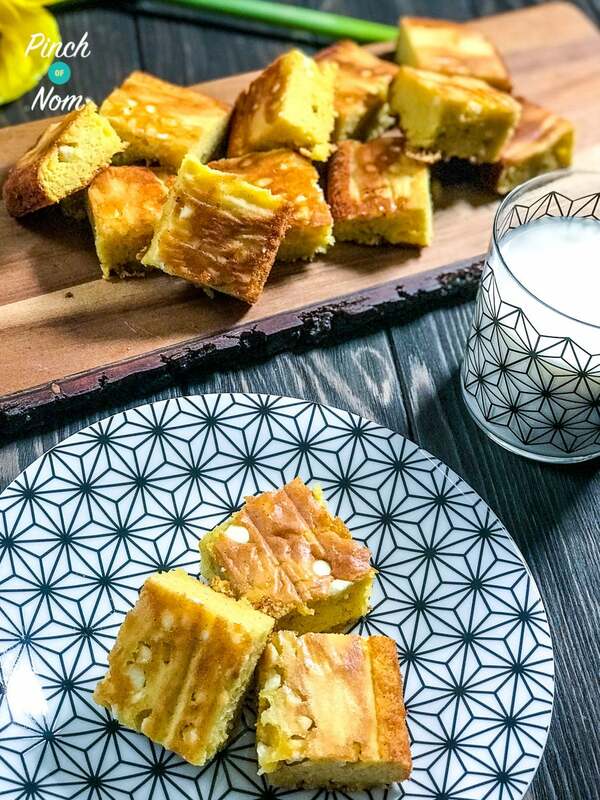 If white chocolate is more your thing, then these Low Syn White Chocolate Blondies will be right up your street! 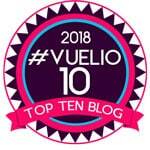 Soooo gooey and squidy, you won’t believe they’re Slimming World friendly! 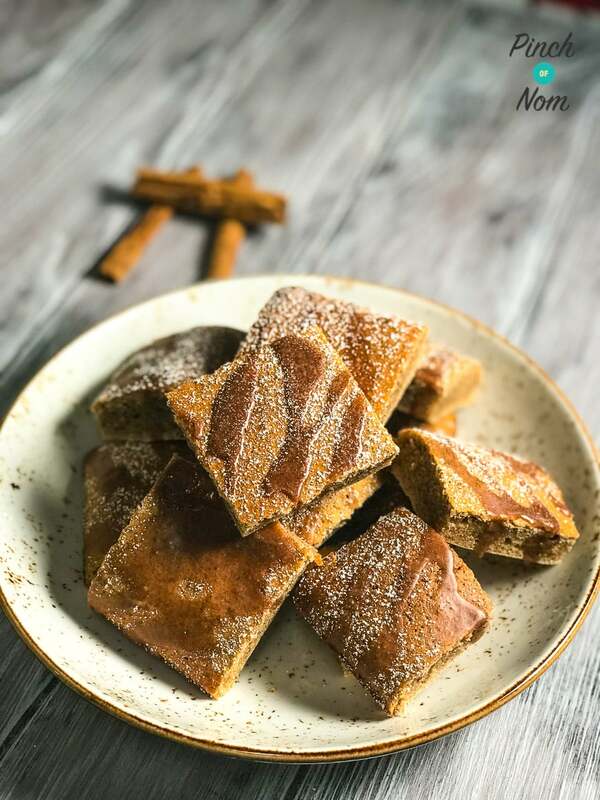 Next up on our list of Top Slimming World Afternoon Tea Recipes are our Low Syn Cinnamon Drizzle Squares. It’s one of our more recent recipes to be added to the website, but it’s gone down an absolute treat with our Facebook group and Instagram followers! Like all our of baking recipes, Low Syn Cinnamon Drizzle Squares are really easy to create, even if baking isn’t your forte. At the end of your baking escapades you’ll be rewarded with a sweet treat that will finish off your afternoon tea superbly. At just 2.5 Syns per square, this really is a fantastic Slimming World afternoon tea recipe that you’ll try out time and time again! You could even cut them into smaller pieces for your afternoon tea to make the Syn value less. 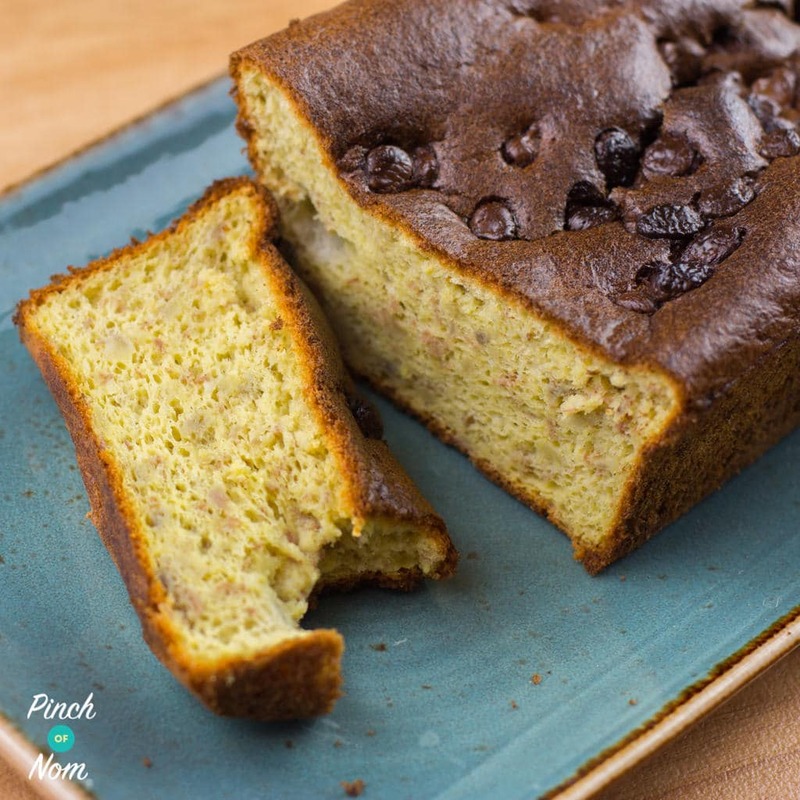 Next is not only one of our Top Slimming World Afternoon Tea Recipes, but one of the very best baking recipes we’ve got – Low Syn Banana Bread with Chocolate Chips. As with all our baking recipes, it’s very easy to create, even if you feel your baking skills aren’t quite up to scratch! At just 2 Syns a slice, our Low Syn Banana Bread with Chocolate Chips provides a proper cakey treat to any Slimming World afternoon tea! 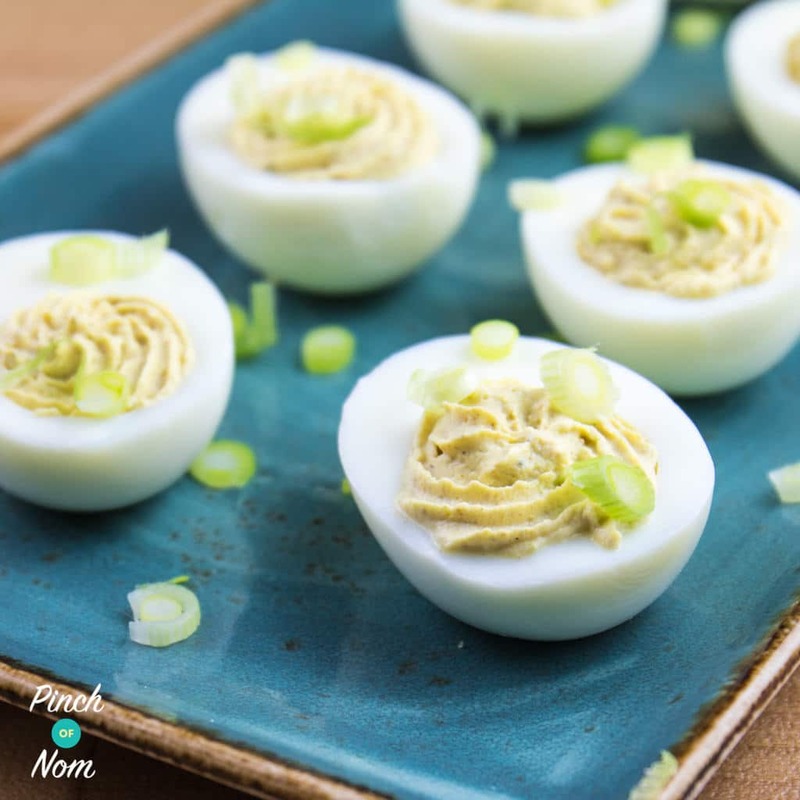 Not everything on our Top Slimming World Afternoon Tea Recipes has Syns – these Syn Free Stuffed Eggs are seriously tasty, but Syn Free! 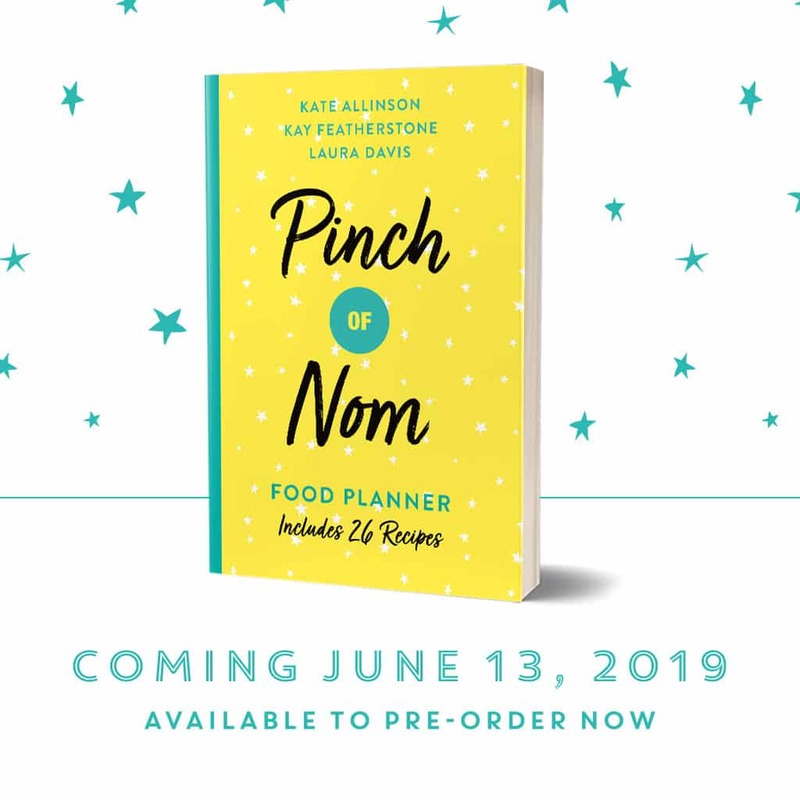 They’re a great way to fill up without using up your Syns, meaning you can enjoy all of the offerings at your afternoon tea! 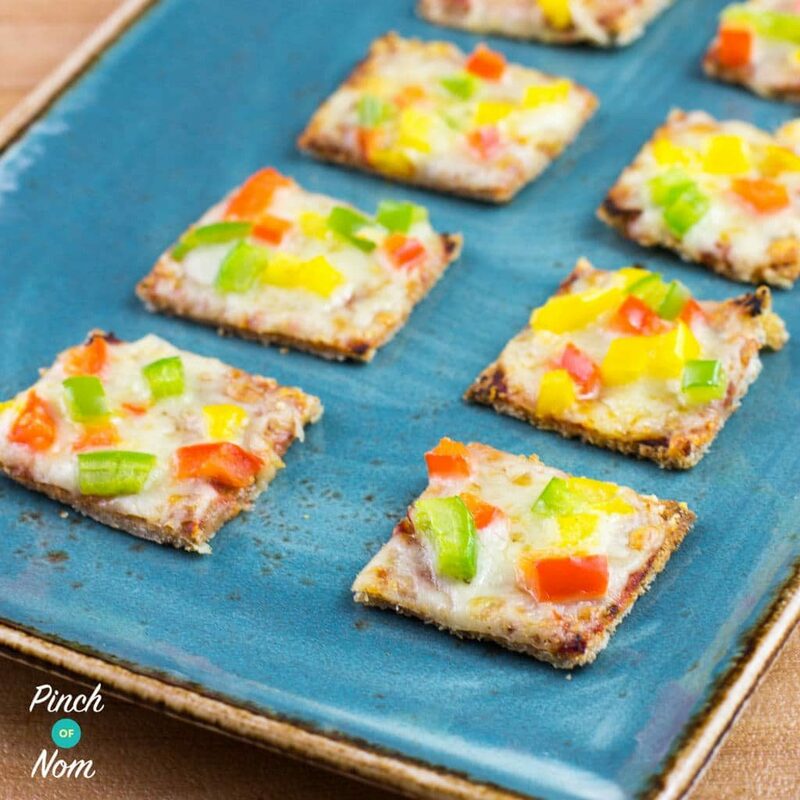 Time for one of our savoury Slimming World afternoon tea recipes now, in the form of our 1 Syn Each Mini Pizza Bites. Some guests at an afternoon tea may not have the thoroughly sweet tooth that usually suits such an event, so adding these 1 Syn Mini Pizza Bites will do just the trick for those who prefer something a little more savoury. The kids will love them too! The very best thing about this Slimming World afternoon tea recipe is just how easy they are to make. A few very simple ingredients put together in an even simpler fashion, our 1 Syn Each Mini Pizza Bites certainly won’t last long! 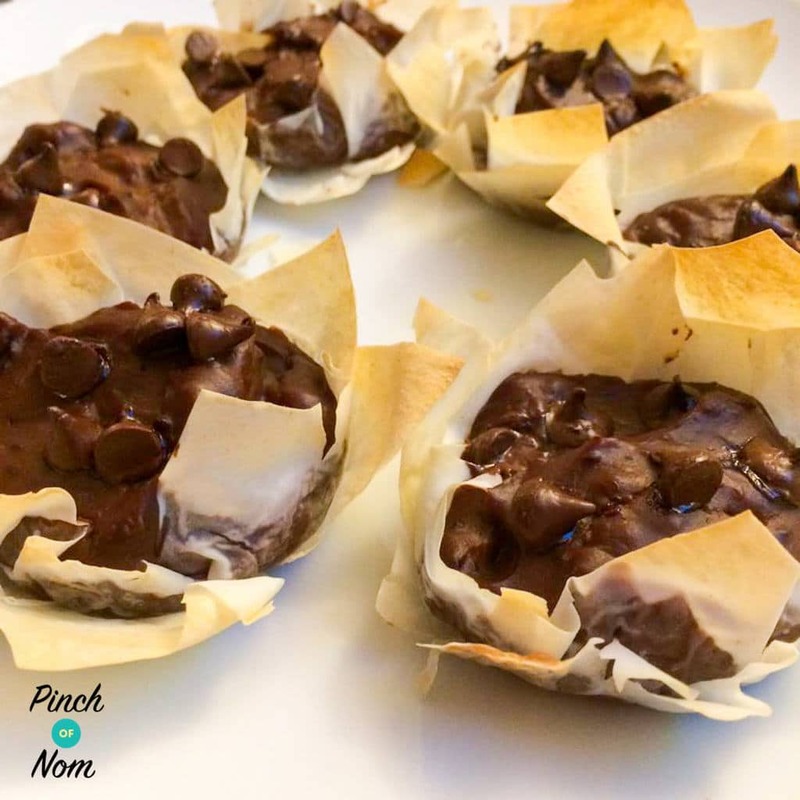 If you love an after dinner mint, then you’re going to adore these Low Syn Mint Choc Chip Tarts! 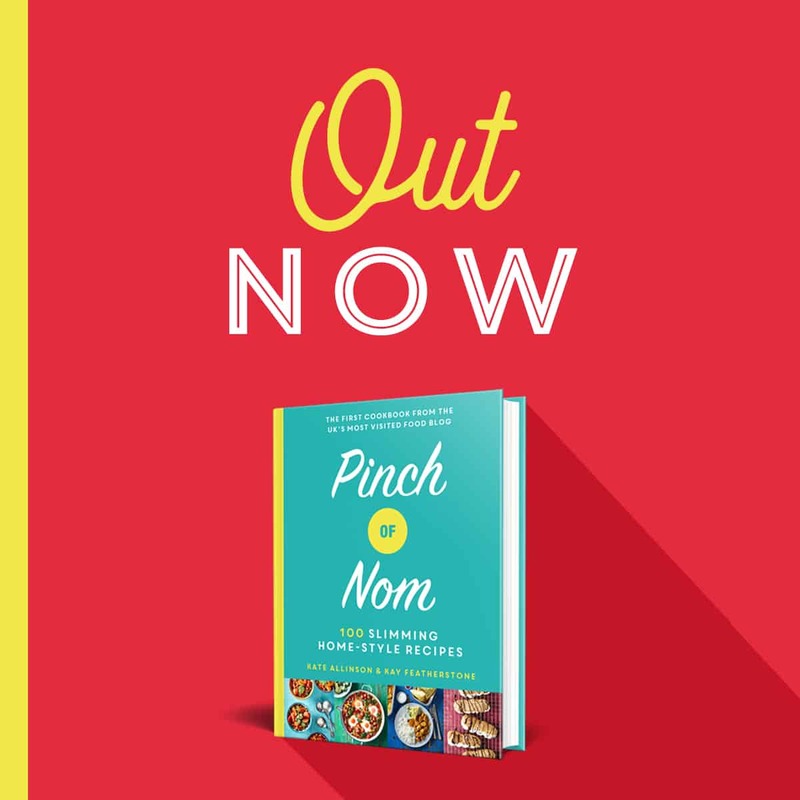 They’re a rich and indulgent treat but won’t break the Syn bank, leaving you free to sample some more tasty morsels from our Top Slimming World Afternoon Tea Recipes! Filo pastry is a great alternative to buttery puff pastry, but still has a good crunch. If you prefer a different flavour, try adding some orange extract instead of the mint! 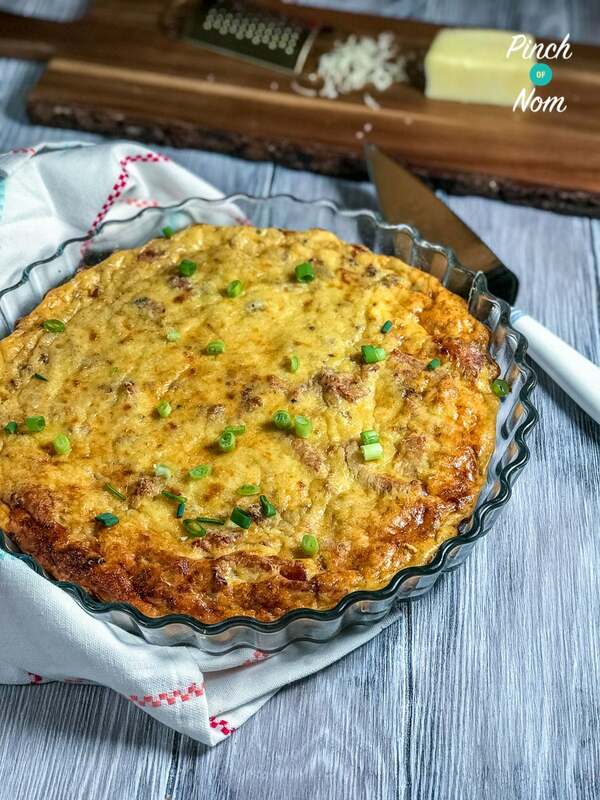 Perfect for picnics, parties and patio teas, this easy to bake Syn Free Crustless Quiche Lorraine has everything you want from a normal quiche, but without the pastry! Not only does the lack of crust mean that it’s Syn free (when you use your healthy extra A) but you’d be surprised at how many people prefer a quiche without it’s outer casing. You can change the fillings too – why not try some tomato, ham, peppers – or whatever takes your fancy! 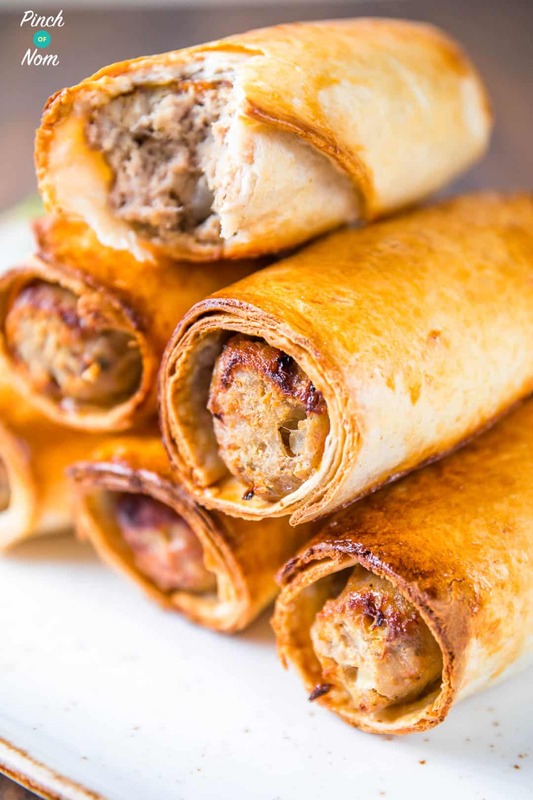 When it comes to finger food, these Syn Free Sausage Rolls are a firm favourite and let’s face it, everyone loves a sausage roll. The hard part is stopping yourself from putting them on your plate before you realise you’ve forgotten to count your Syns! Fear not though, for these amazing Syn free buffet bangers … well bangers wrapped in your healthy extra B … are a sure win for any afternoon tea you’re planning on having this summer! Afternoon tea is traditionally served with a hot drink (errr…tea!) 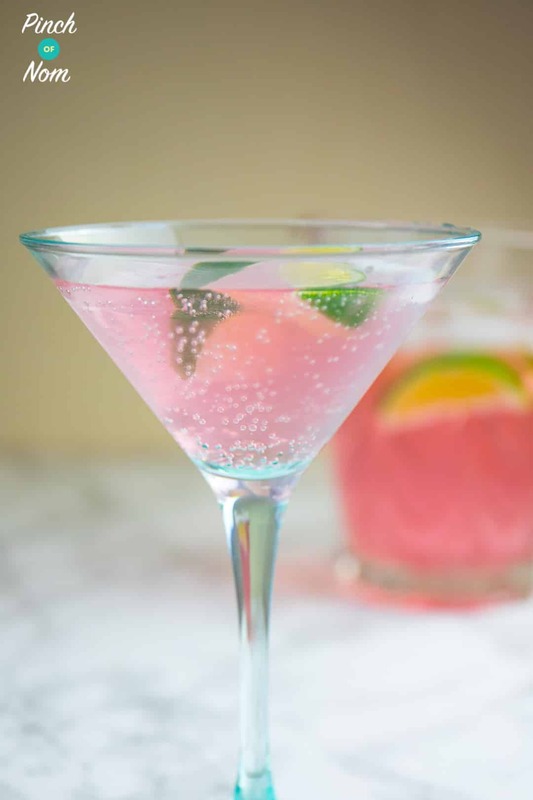 but champagne afternoon tea is proving pretty popular so why not try one of these sparkling cocktails instead! 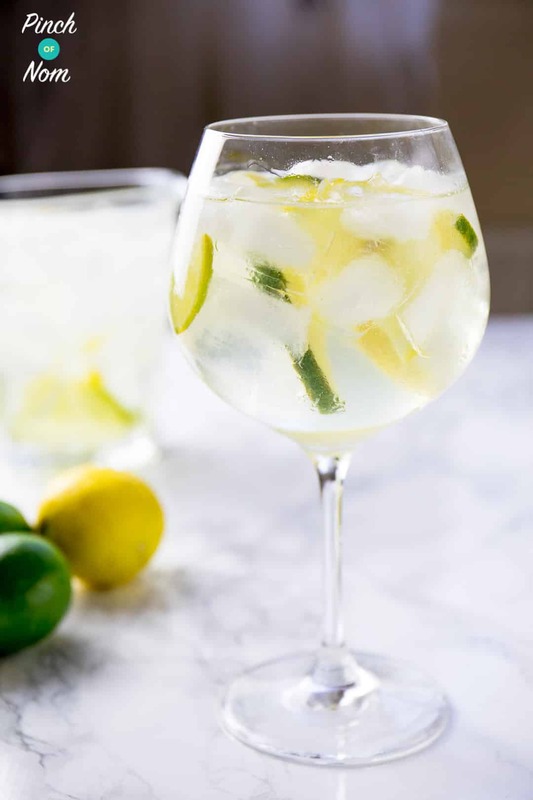 This 4 Syn Elderflower Gin Fizz Cocktail is light and refreshing with a boozy kick. 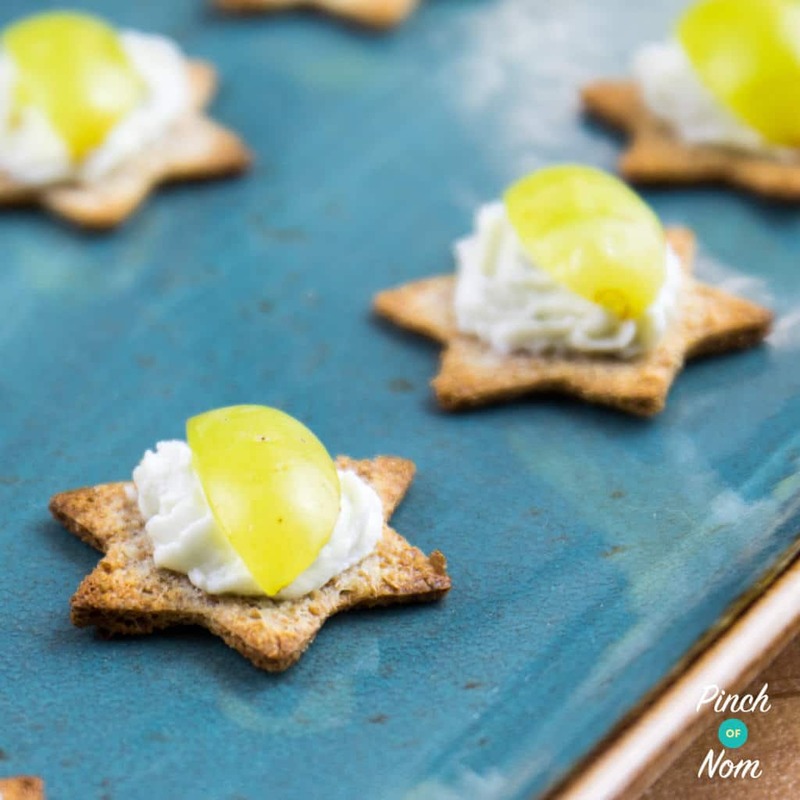 The taste of elderflower screams of the summer time and it works as a great palate cleanser between tasty bites! If you’re looking to woo you’re afternoon tea party guests, then this 3.5 Syn Woo Woo Cocktail is just the ticket!